Want to access all your Blackboard courses and interact with other students, wherever and whenever you choose? Now there's an app for that. Blackboard is a platform used by many universities within Australia to provide learning resources to students, posts grades and assignments and as a communication medium. Whether or not improvements could be made to the underlying Blackboard architecture, the introduction of the latest Blackboard Mobile app for iPhone is certainly a blessing for both students in educators alike. The interface is user-friendly and aesthetically pleasing, which makes it very easy to access course resources. All the basic content that is available on the standard web interface is available via the app. 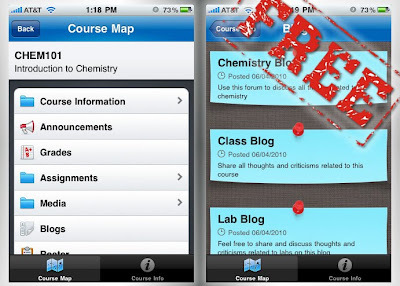 With the introduction of the latest of iOS4 (iPhone software) you can comfortably multi-task between Blackboard Mobile Learn and core iPhone apps (e.g. Safari). So I encourage all students to send emails to their University, and get this setup.